House clearance Nottingham is our most popular service. We clear houses 6 days a week - therefore we'd like to think of ourselves as experts in the local clearance of houses as well as general rubbish removal. We would clear on Sunday's but the waste stations are closed and legal tipping is therefore not possible. Our jobs range from very small tasks to major multi truck jobs and we commonly do time critical clearances for people traveling to a location from around the UK and abroad. Many of our business partners are legal firms where we work closely with their Probate Sections providing these clearance services are part of the executors requirements. We undertake all types of house clearance and rubbish removal . No house clearance in Nottingham is too big or too small. Our professional friendly junk removal team will ensure your house is cleared in the quickest time possible with the utmost care taken. We are proud to say that we have never said no to a job. Our minimum charge is just £57. Our charges reflect the volume of junk that needs removing - the smaller the amount of junk the cheaper it will be - please refer to our price guide to find out how much your house clearance will cost. Our prices are final and include all labour and disposal fees. If you need an entire house cleared from Top to Bottom - we can help. We understand how stressful times can be when you need a house cleared of junk. We have 7 Years experience within the clearing of homes of a deceased or incapacitated relative as well as preparing houses for rental or sale - whatever the reason for your house clearance we provide a professional, reliable and most importantly friendly service. We talk with our customers and find out what their requirements are. Especially if there are any items that are not to be cleared. We clear the smallest room in the home first - this room will then be used as a storage room for any valuable items that are not to be cleared. JunkPorters team then begin clearing the rest of the house - ensuring the clearance is performed in the safest, and most efficient way possible. Once we have loaded up our Junk Truck we give the property a final sweep for any excess dust or mess before taking the rubbish away for recycling. We offer a basic house clearance for customers that only require part of the house clearing. Basic house clearances in Nottingham are always quick, efficient and carried out with a smile. How we do a basic house clearance in Nottingham ? 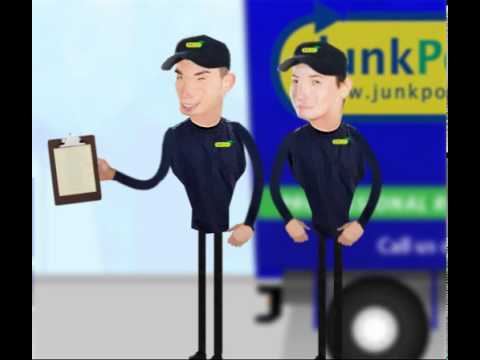 Once we have arranged a time to clear your house - we will arrive at your house - load our Junk trucks and leave you with a clean-junk-free property. You won't need to help lift or assist us in any way. Basic house clearances are usually completed within 30 minutes! We also clear offices, gardens, garages, sheds, cellars and attics in your local area. Some items are harder to dispose of than others. For this reason there may be additional charges for items that cost us more to dispose. Please check our prices page for more information on hard to dispose items. All Quotes are free. If you have an item that you think may be hard to dispose of give us a call for a fast and friendly quote.